A church registration form is a document which is essential to be completed by an individual who will be participating in a church or a religious group. The form will collect the personal information of the new member or the participant in order to allow the church in documenting or recording the members that they currently have in the organization. On the other hand, specific church registration forms are also used for events and activities that the church will be holding such as sports leagues, summer camps, and even church concerts. Why Use a Church Registration Form in Word Format? Church registration forms in word formats are easy to navigate and use by anyone who will be participating in the church. One advantage of this format is that it can be converted to other formats since it is the basic or the building block among all formats. To use the registration form in word format, the device where it will be accessed should have a Microsoft Word software application or other word-processing software applications which are compatible with the “.DOC” extension of the format. Step 1: Open a word-processing software application. There are many types of word-processing software applications around the web which can be obtained by a church, some require a license while some are free and are already installed in the device. Nonetheless, when choosing an application, the church staff or the person who will be preparing the document should be knowledgeable in navigating through features and functions of the software application to ensure that the registration form will be created with ease and in a lesser period of time. Step 2: Prepare the sheet or set the margins and other measurements for the document. Margins, indentations, typefaces, and even the paragraph style should be set before filling in the contents of the church registration form. In addition, the formatting and styles to be incorporated into the document should be based on the other documents that the church currently have or on the preferences of the church, specifically the elders, as well as the church members. Step 3: Make three horizontal sections. Each section will be for the different types of information to be placed in the form. To separate the sections, a line can be used or a set of dashes to indicate the starting points and ends of each section. On the other hand, lines, and dashes can be replaced with the title of each section, however, the title must be emphasized either by having it in bold or in italic style. Step 4: Allocate the first section as the header or the church banner. Some word-processing software applications have a default header at the top margin. This means that the top measurement of the top margin will depend on the number of lines that the header will consist of which can result in an uneven set of margins in the document. However, a user can also create a header below the margin to make the header as the first section of the form. Regardless of where the header will be placed, either on the top margin or inside the margin area, it should always have the necessary information to welcome the user with the details of the church. In the header, the name of the church, the church’s address, the praise and worship or the activity schedule, and the contact information of the church, as well as the church’s logo, should be indicated. Step 5: Add information or data fields in the second section of the form. This section will be for collecting the personal data of the participant. If the goal of the registration form is to gather the list of participants in one form, rather than individually providing separate forms for each participant, then a table consisting of rows and columns for the participant’s name, age, and contact numbers can be used. On the other hand, if each participant will be using one church registration form for the event, then the data fields for the participant’s full legal name, age, date of birth, electronic mailing and residential addresses, and his emergency contact information should be some of the information to be collected in this section of the form. Step 6: Incorporate statements and agreements in the last section of the form. There are several agreements or statements which can be included in a church registration form. Among the common agreements is a photography release agreement statement, as well as a hold harmless liability agreement. A photography release agreement will be for documenting the approval of the participant in letting the church staff take photos wherein he is included during activities, programs, and events. While the hold harmless liability agreement will be for documenting that the participant agreed to join the church and the activities yet will not hold the church liable for any accidents and injuries that he will incur in the duration of his participation. Step 7: Add a signature block and save the form. Below the agreement statements should be a signature block for the signatures, names, and the date when the form is completed by the participants or the participant of the church event. Then, the form should be saved in a format which allows future edits to be made. Church Bible School Child Registration Form – Conducting Bible study sessions and cell group meetings are essential for the spiritual growth of a believer or a church member, especially those who are still children or minor individuals. For this, a church bible school child registration form should be prepared by a church who offer Sunday school that teaches the importance of the Bible and the lessons to be learned from the Holy Book. In a church Bible school child registration form, there are two main sections wherein the second section is divided into two parts. 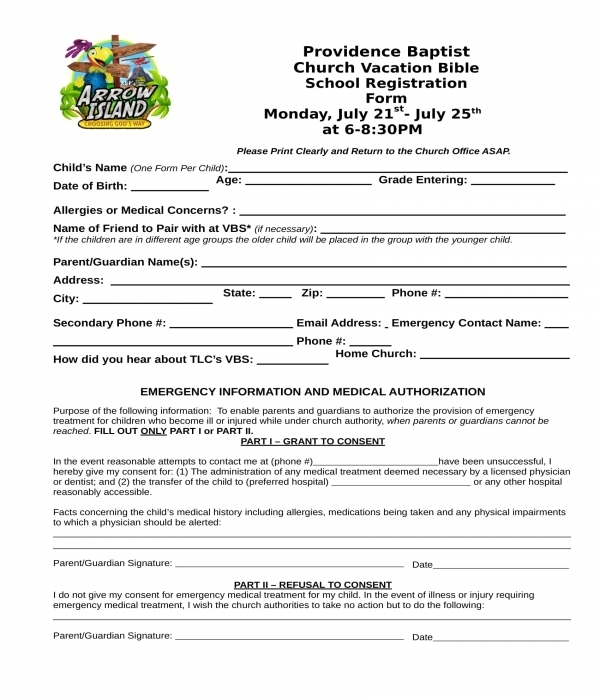 The first section of the registration form is the child information section which is for disclosing the name of the child who will be attending the Bible study or school along with his date of birth, the grade level that he is in, and his medical details such as his allergies and medications. This section of the form also will be where the identification of the child’s parents or legal guardian will be stated which should indicate the guardian’s name, address, and phone numbers. The second section of the form is intended for the emergency information and medical authorization to be given by the parent or guardian of the participating child. If the parent agrees to grant his parental consent for the child to receive emergency treatment to be administered by the church during the period of the Bible study, he must fill out the child’s health and medical information in the first part of the second section. On the other hand, if the parent refuses, then he must affix his signature in the second part of the second section to document his consent refusal and the date of when he signed the registration. Church Children’s Ministry Registration Form – Churches who have separate ministries for each age group and category of their members should use a registration form as well. 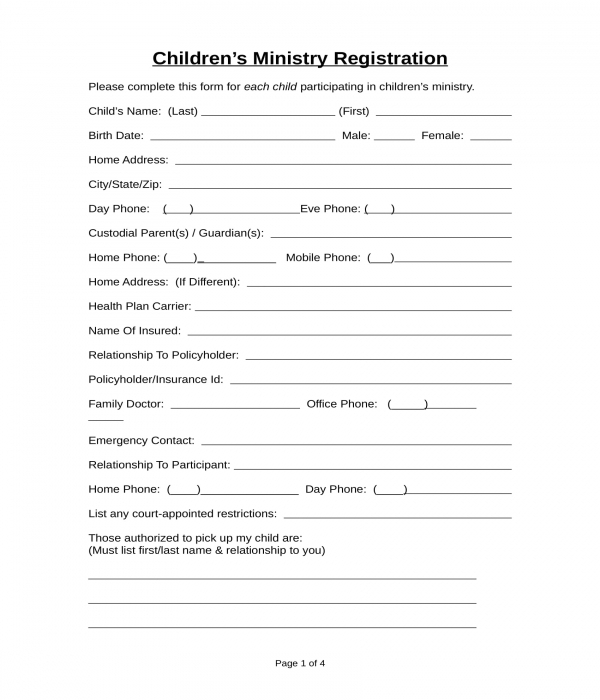 To churches who offer a children’s ministry for the children of their members, a church children’s ministry registration form is the right document to use. The form must be filled out by the parent of the child who will be joining the ministry. In the form, the parent will be able to state the name of his child, their addresses, contact information, as well as their health insurance details along with the name of their health carrier and family physician. The names of the individuals who are permitted to pick up the child after the ministry service will also be enlisted in the form with the indications of the individual’s relationship to the parent and the child. Moreover, a medical information section is also incorporated in the form. This is for disclosing relevant medical data which should be known and be acknowledged by the head of the children’s ministry and the church about the child. Church Choir Registration Form – Without a choir, the praise and worship portion of a church service will not be filled with glorious, meaningful, and moving songs of praise. This is why it is encouraged that whoever have exemplary voices in a church should begin participating and be part of the church choir. For this, a church choir registration form should be completed by the interested church member. The form will simply collect the general information of the member or the child who wants to be part of the choir along with his contact numbers and the information of the church. Church Dance Workshop Registration Form – Aside from a church choir or a singing group in a church, there are also other talents which are supported by churches, significantly all possible talents of their members including the talent of dancing and entertaining the crowd. 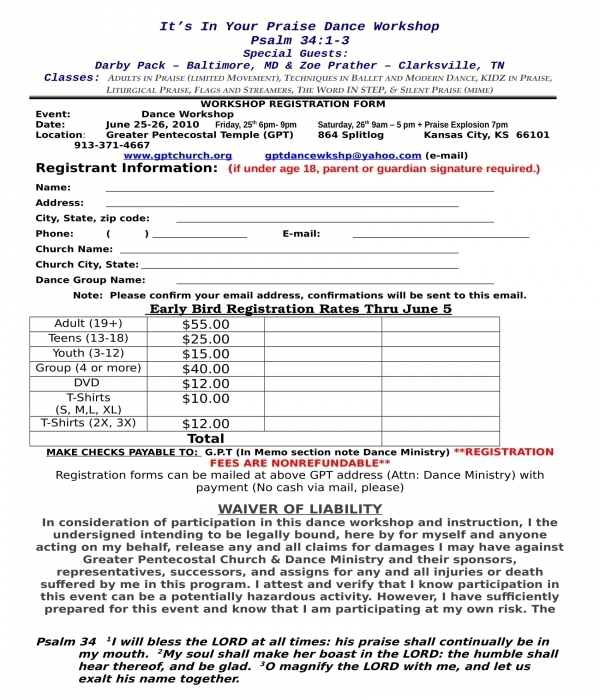 To open registration for a dance group, a church dance workshop registration form can be used. This type of registration form will have two separate sections which should be filled out by the member or the registrant. The first section is the registrant information section which is for the details of the registrant, and the list of registration fees to be paid for the period of the workshop. A waiver of liability statement is the content of the second section of the registration form. The purpose of the waiver of liability statement is to inform the participant of the workshop that he will be held liable for any unfortunate incidents that will happen to him during the workshop and that any damage claim will be released by him or be waived by him as he signs the registration form. Church Day Camp Registration Form – When one gets involved in a church, he must expect that he will be able to join various activities ranging from family day celebrations and even day camping events during the summer. 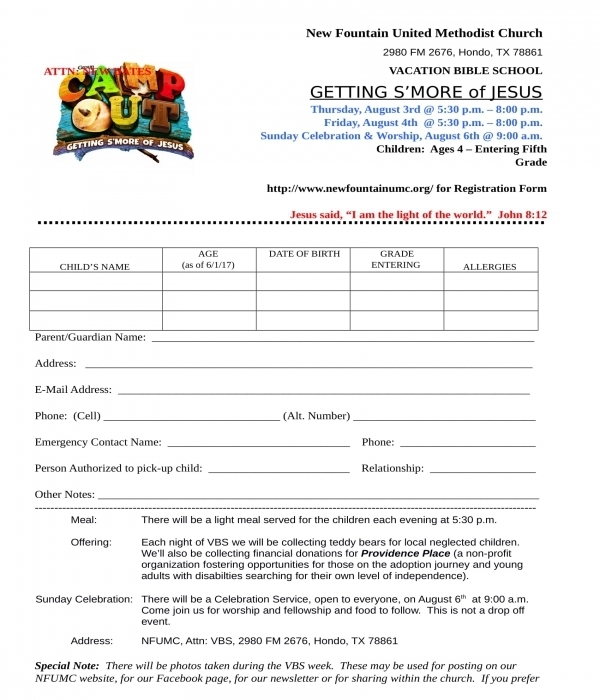 Specifically, for a day camp or a summer camp, a church day camp registration form must be used. The form will have the name of the camper first along with his age. Then, there will be five succeeding sections to be filled out wherein the first section is for the details of the camper while the second section is the parent information section. Emergency contact information and the names of the people who will be the alternate authorized representative of the participant’s or the camper’s legal guardian will be the focus of the third section of the form. In addition, the fourth section of the form will be the medical release information section wherein the medical data ranging from the medical issues, problems, and the required medical treatment of the camper will be discussed. Lastly, the fifth section of the form is where the details of the payment for the camp will be defined along with a photo and transportation release agreement statements. 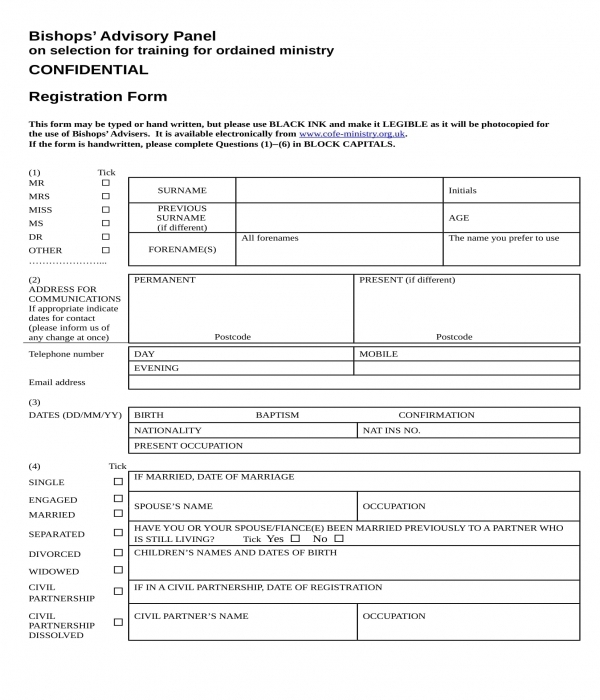 Church Member Information Registration Form – This is the type of church registration form which is often used by churches or religious organizations. In a church member information registration form, the personal information of the new member will be disclosed. These details will be recorded by the church in order for them to document the details of their members as well as know how they can reach their new members through the stated contact details and email addresses. Other pieces of information which are to included in a church member information registration form are the indications of the member’s civil relationship status, the employment information of his spouse if ever he is married and if his spouse is not yet deceased, the names of he and his spouse’s children, as well as the name of their former church if they have attended any congregation before. Additionally, there is also a section in the church member information registration form which is intended for enlisting and identifying the personal interests and hobbies of the new member. The objective for this section is to determine what activities will aid in engaging the new member for him to be able to use his talents and skills in the church. Church Sports League Registration Form – Sports can serve as part of the recreational activities in a church, especially for the members who are sports enthusiasts or inclined to extreme adventures and games. To collect the information of members who will want to join the league or the sports event of the church, a church sports league registration form must be prepared for the registrants. There are three sections in this variety of church registration form. The name of the interested registrant will be stated in the first section of the form which will be accompanied by his age, gender, date of birth, parent’s name, contact information, and address. The medical insurance information of the registrant will have to be stated in the second section of the form along with the name of his doctor, the specific field of practice of the doctor, the doctor’s office address, phone number, and the name which is enrolled in the insurance coverage if the registrant is not the principal holder of the insurance account. The third section of the form, on the other hand, is for the shirt size of the registrant and a statement regarding the need for the church to be permitted in contacting the doctor of the registrant in the event of an emergency where the registrant is involved. 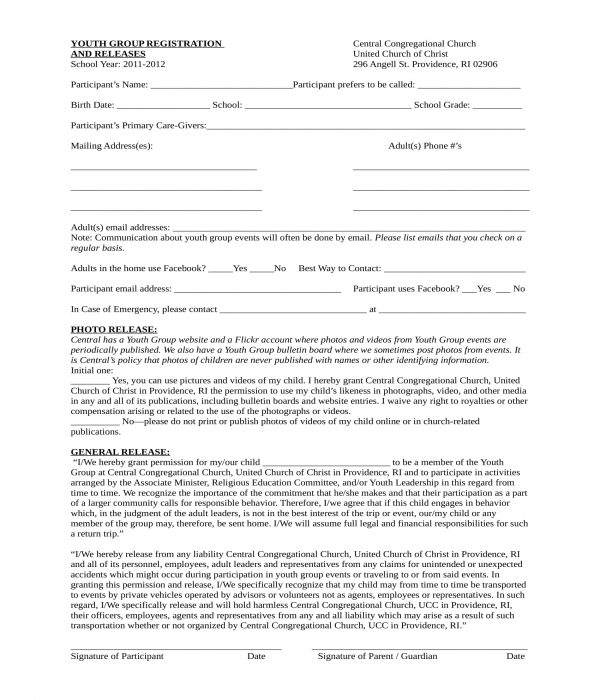 Church Youth Group Registration and Release Form – Eight sections comprise this variety of church registration form. In the first section, the details of the participant will be stated which should have the name that he prefers to be called by the church members, his date of birth, and the contact information of his primary care providers. The second section of the form is the photo release agreement while the third section is intended for the general release agreement. The fourth section of the form is for the health information of the participant wherein the list of health issues and the data of the emergency contact person of the participant will be enlisted. In addition, the participant’s regular prescribed medications and treatments which should be noted by the youth group members are also required to be stated in this section of the form. Moreover, on the fifth section of the form, a parent and legal guardian authorization will have to be signed by the participant’s guardian in order to allow the congregation or the church in administering medical actions to the participant whenever necessary. 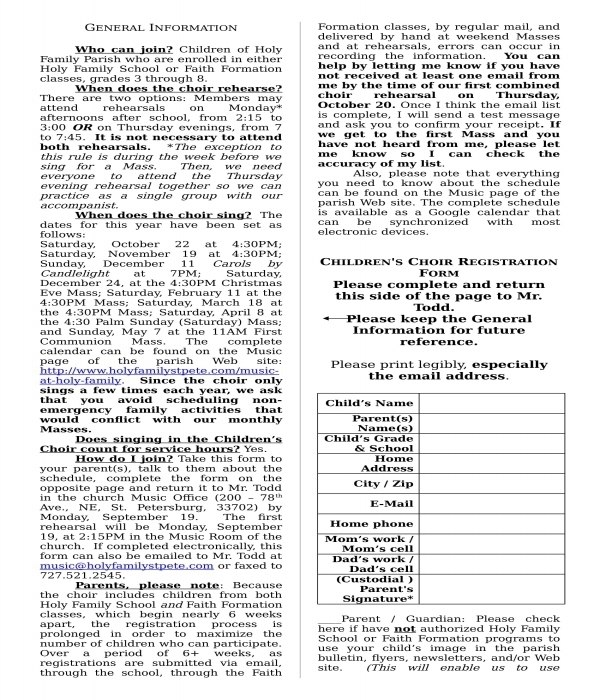 The sixth, seventh, and eight sections of the form are for the explanations of the rules, covenants, and a master permission slip needed to be signed by legal guardian of the youth participant that he permits his child to join activities to be conducted by the youth group and the church unless he specified and informed the congregation of any refusal. 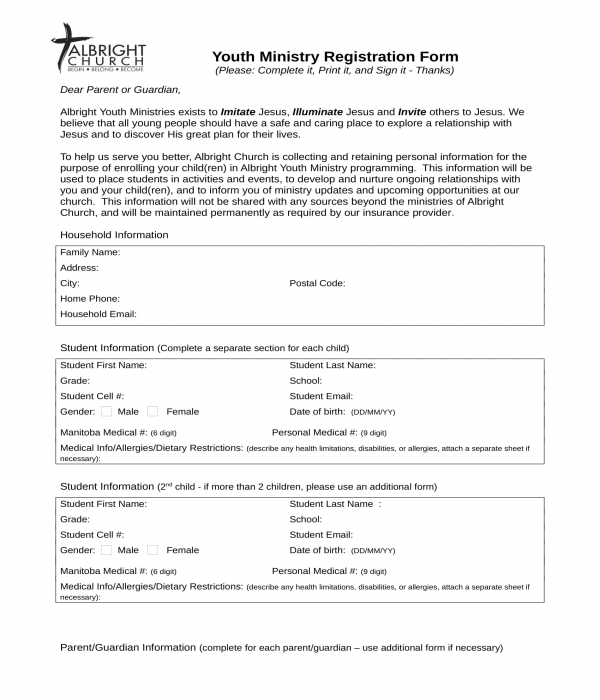 Church Youth Ministry Registration Form – Aside from children’s ministries, there are also youth ministries wherein the encouraged members are teens and young adolescents. To join and be part of a youth ministry, a church youth ministry registration form should be completed by the applicant’s parents or legal guardian. 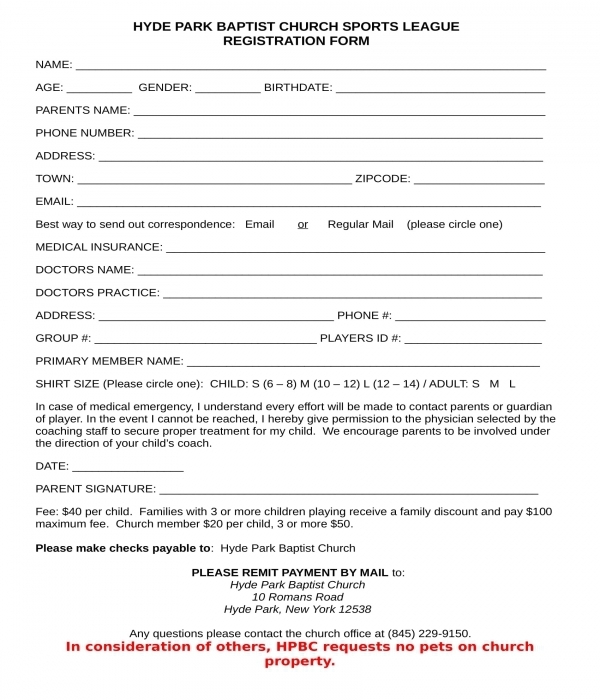 In the church youth ministry registration form, the parent can register more than one individual. The form will collect the household information of the applicant which includes their household email and contact numbers. 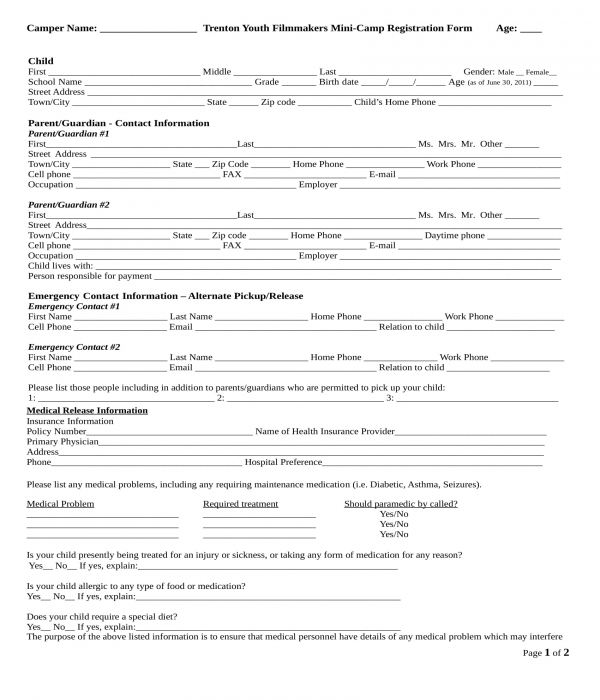 There is also a section of the form which will gather the details of the applicant such as his name and the contact information of his medical provider. The information of the applicant’s parents and legal guardian will be disclosed in the form as well along with an assumption of risks and liabilities to be agreed, approved, and be signed by the parent or the legal guardian of the applicant joining the ministry. Confidential Church Ministry Candidate Selection Registration Form – This variety of church registration form is not for every member of the church rather only for those who want to pastor the church or be the head of a church ministry or group. This document will help the congregation in determining whether or not the registrant or the user of the form is suitable for the position in the pulpit. 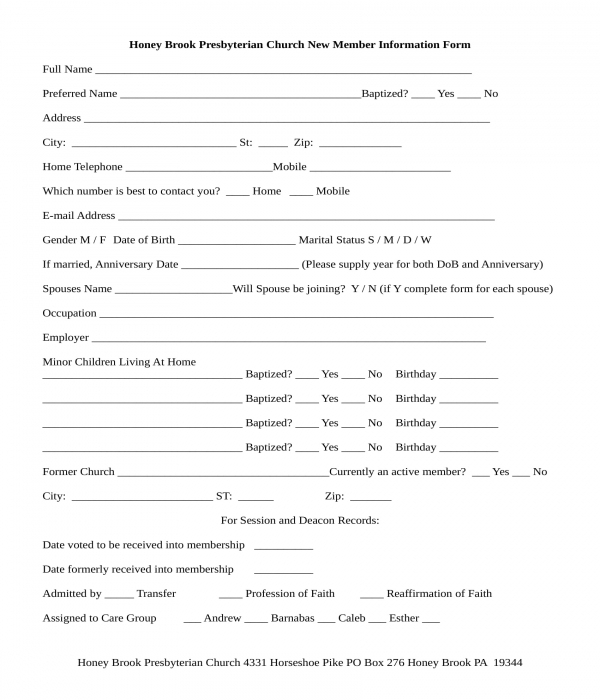 In addition, this form can also be used for recording who among the church members are willing to be trained as candidates for the positions opened in the church. In other words, a confidential church ministry candidate selection registration form acts similarly to a job application form, however, the difference is that it is flexible to be used during training sessions of the candidates, as well as during seminars and workshops necessary for their individual spiritual growth. Aside from “.DOC” or the word format, there are also other formats that a church or a religious congregation can consider using to create the registration form that they will be needing. Other formats are “.PDF” or the portable document file format, and the “.XLS” or the spreadsheet format. Each of these formats, however, is associated with different features and functions in comparison to the “.DOC” format. But regardless of the format to be used by the church, every piece of information disclosed in the registration form must be kept confidential and be used only for specific purposes agreed by the owner of the information.